You can trust turning over your recruiting needs HR Knowledge’s expert team. Our Hiring Process Management™ Boston, MA service (HPM) follows a methodology that embraces the range of tasks involved from crafting the job description to candidate acquisition, vetting and selection, and even negotiating the employment offer. We relieve the burden of analyzing and evaluating prospective employees and make the process manageable for you. Our HPM services will free you from the “upfront 90%” of effort required in filling positions within your company. Here at HR Knowledge, our HR Management Team has over 100 years of combined experience in the field of hiring, recruiting, and all other human resource requirements. We know and understand how and what it takes to find the perfect candidate for your open opportunity, and to help the perfect candidate find you. When it comes to hiring process management, Boston based organizations need to understand that they are only as strong as the people they hire. Investing in an individual is always a risk: What if they are not a good fit within your organizations culture, or after they start you are left wondering, “where is the person I interviewed”? HR Knowledge takes the time to understand your culture and your needs and we have the experience and recruiting expertise needed to provide our clients with a short list of screened candidates that fit each organization ‘to a T’. Contact us to learn more about how our low cost non-agency fee model can free you from the “upfront 90%” of effort required in filling positions within your company. 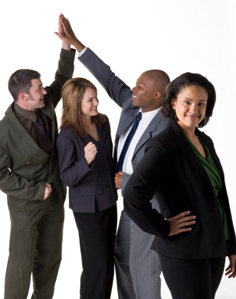 Our outsourced recruiting program is designed to help employers find employees that fit in with the company. We take the time to get to know our clients by understanding who they are and what they’re looking for. From there, our recruitment team works with each client to carefully craft job descriptions and post them in appropriate job boards and social media outlets. Then we screen the candidates for our clients before presenting them with short lists of the best interview selections. With our hiring process management, Boston, MA organizations can be free of the burden that comes with evaluating prospective employees and feel confident they are hiring the best talent for their organization.